Symptoms will vary and attacks can last for hours, days or weeks. Symptoms may be very infrequent or a continual problem. Symptoms include any combination of wind, pain, diarrhoea, constipation or bloating. It is important to have symptoms checked by a medical doctor to eliminate other causes. A colonoscopy (an inspection of the bowel using a scope) will be performed by a specialist such as a gastroenterologist. Roughage, fat, alcohol, constipation, diarrhoea and stress can all contribute to symptoms. If you feel unsure about the measures you should take, you should see your doctor and an Accredited Practising Dietitian. 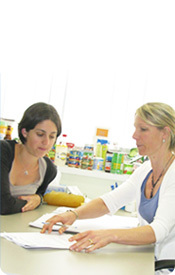 You may check in the yellow pages for a dietitian near you or contact us at the Perth Diet Clinic on 08 93224680. There are many books written on IBS giving different advice. This can be confusing. It is best to see a dietitian who can advice you on an individual meal plan to suite your life style. * Have soft bulking fibre like bran or psyllium husks in your diet. * Avoid the skins, seeds and grains in fruit, vegetables and cereal products. * Drink 2 or more litres of water a day. * Moderate caffeine and alcohol intake. * Dining out- select low fat foods and limit alcohol intake. * Controlling stress is very important - look at your life style and find ways of slowing down and becoming a more relaxed person. Try not to do too much at the same time. Set your priorities! IBS doesn't need to be an on going problem if you adopt diet and life style changes.